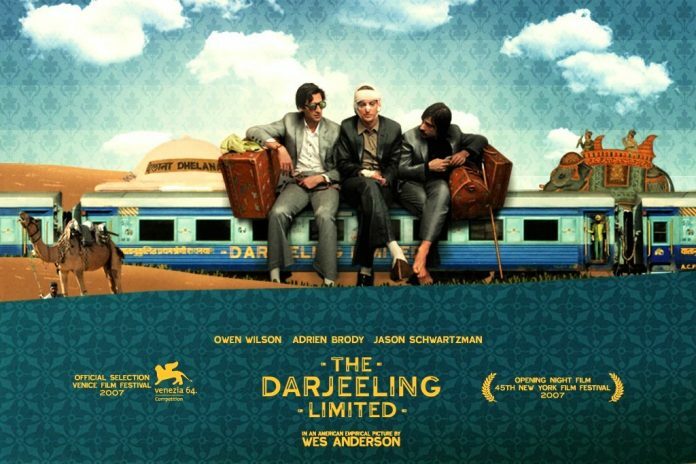 Wes Anderson’s 2007 film, The Darjeeling Limited is the story of three brothers who embark on a train journey across India after the death of their father. It went on to win lots of awards and has been called one of Anderson’s best films. But how does it hold up today? The film tells the story of three American brothers who haven’t spoken to each other in a year; since their father’s funeral. Having nearly died on a motorcycle accident, The eldest brother, Francis (Owen Wilson), wants to reconnect with his younger siblings. The train takes them through the countryside of North India, past various Hindu temples. However, it isn’t until they are well on their way that Francis reveals that true reason of the trip is to meet with their mother; who has become a nun living at a Christian convent in the Himalayas. Already annoyed with Francis’ controlling behaviour, the brothers begin to quarrel in earnest leading the train’s Chief Steward to have them thrown off. This leaves them stranded alone in the middle of the desert with eleven suitcases, a printer, and a laminating machine. But eventually, the brothers come together through brotherly bonding, and finally and reconcile. Scripted by Anderson himself in collaboration with Roman Coppola and Jason Schwartzman, the film is somewhat meandering. Though only a mere 90 minutes long, it manages to pack in an extraordinary amount of dramatic and comic moments; as well as lots of tension. Owen Wilson, Adrien Brody, and Jason Schwartzman are all well cast, playing off each other and making the way that the brothers gradually forge a new kind of friendship all ring quite true. Even their relationship with their strong-willed mother Patricia (Anjelica Huston) helps in understanding their melancholy and frustration. From the vast open spaces of Rajasthan to its bustling cities, the film expertly showcases Anderson’s love of strange and beautiful things amidst the colours and chaos of India. The music from the films of Satyajit Ray and old Merchant Ivory productions compliments this perfectly. Anderson’s wonderful use of local colour — especially the reds and yellows of the desert — further bring to life delights of travelling to faraway lands. Funny, full of warm sentimentality, and stunning scenery, The Darjeeling Limited feels like a slightly overstuffed but nonetheless charming film.